Strictly speaking this is not an amphora shaped-vessel, but it does seem to have travelled long distances and is large enough to have carried a considerable quantity of goods. 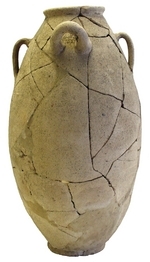 It is a large four-handled jar with a slightly swelling ovoid body and flat base. The handles are alternately horizontal [shorter and rounded section] and vertical [longer and narrow and flattened] on a broad neck. There is a small triangular-shaped rim. The examples from Camulodunum were dated before c. AD 65 (Hawkes & Hull, 1947), while the Augst vessels date to between the first half of the first till the middle of the second centuries AD (Martin-Kilcher, 1994). Not known for certain but almost certainly Italian. Present at Camulodunum (Hawkes & Hull, 1947), Haltern and Augst (Martin-Kilcher, 1994). Unknown although wine or perhaps preserved grapes are possibilities (Martin-Kilcher, 1994).